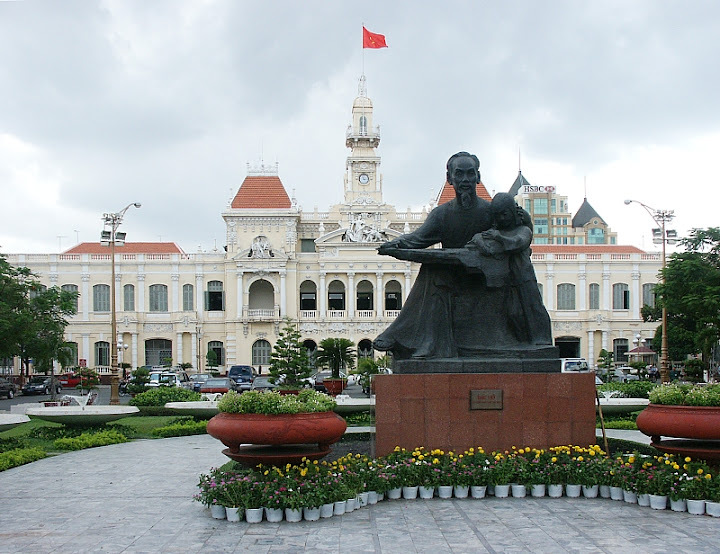 Under the French, Ho Chi Minh City was called the "Pearl of the Orient". Ho Chi Minh City is the biggest city in Vietnam with hundreds of rivers and canals. With 300 years of foundation and development, Ho Chi Minh City has witnessed the construction of numerous ancient buildings. In the general view, one of the cultural characteristics of 300 years of historic Saigon - Gia Dinh is the combination of the 3 cultural sources: Vietnamese, Chinese and European, which have made its urban structural architecture. It was constructed between 1964 and 1971 following the design of architect Nguyen Ba Lang. This classic style seven storey tower with strong Japanese influences was built with the assistance of the Japan-Vietnam Friendship Association. The kwan-Yin tower is located on the left of the pagoda. This structure is the biggest of the Vietnam Buddhist Association. The Pagoda is dedicated to Thien Hau - The Sea Goddess who protects fisher folk, sailors, merchants and anyone else who travels by sea. It said that Thien Hau can travel over the oceans on a mat and ride the clouds to wherever she pleases. Her mobility allows her to save people in trouble on the high seas. It contains countless artifacts, photographs and pictures documenting American war crimes. Such documents illustrate the killing of civilians, spreading of chemicals, torturing of prisoners and the effects of the war on the north. Planes, tanks, bombs and helicopters are also on display. The building was formerly the palace of the Cochin-china Governor, and then the office of the Imperial Delegate the King's special envoy. Numerous pictures and exhibits related to the struggle against French colonialism and the American aggressors to liberate and to protect the City, Particularly, there are images relates to the General Uprising in the Mau Than Spring (1968) and the historical Ho Chi Minh campaign (1975) to liberate the Country. The house was inaugurated on January 1st 1929 and previously called Blanchard de la brosse. The museum are exhibited antique articles such as Ngo Quyen's stakes the Nam Han, stone steles, Buddha statues and other ancient ceramic articles, ivories, bronze drums, gongs... Particularly there is a special hall to exhibit the Oc Eo civilization (about the 5th Century) from the South. It was completed in 1966; the present Hoi Truong Thong Nhat was the former Independence Palace. It was designed by Western-trained Vietnamese architect Ngo Viet Thu. Was built between October 1877 and April 1880. With the approval of the Vatican the cathedral was named Notre Dame during ceremonies held on December 7-8, 1959. Its Neo-Romanesque architecture with two - 40m square bell towers crown the Paris Commune Square where it is located. It is really a typical Chinatown in Vietnam with its market still full of from forestry to artisan's products. Cho Lon has become an attractive scene for visitors to study the daily life of the City population. Cu Chi is an "Underground village" with its labyrinth totaling more than 200 km. The main tunnel is 60 - 70cm wide and 80 - 90cm high. The structure has either a delta shaped or vaulted ceiling, above the tunnel is a layer of earth about 3 - 4m thick, enough to sustain the weight of 50-tonne yanks or heavy artillery as well as the destruction of bombs up to 100kg. Although it is an underground communication network, the tunnel is enlarged here and there in to rooms large enough to hold large meetings, a medical station or art performances. That are the reasons why Cu Chi Tunnel became legendary during the 1960s for its role in facilitating Viet Cong control of a large rural area only 30 to 40km from Saigon.